Four people were hurt in a partial building collapse in Crown Heights Tuesday morning, the FDNY said. 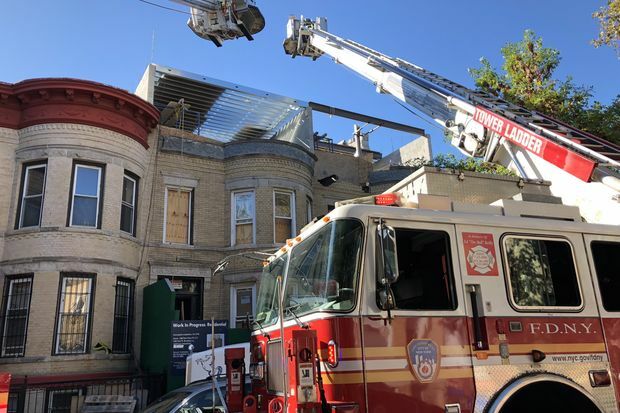 CROWN HEIGHTS — Six construction workers were hurt — four seriously — when a roof abruptly collapsed on Park Place Tuesday morning, FDNY officials said. Workers were putting cinder blocks on top of 1294 Park Place, near Schenectady Avenue, when the roof of the two-story home suddenly gave way around 9:45 a.m., according to the FDNY. "It was too much weight in that area to be supported, and it collapsed into the basement," said FDNY Assistant Chief Wayne Cartwright. Norman Harrison, 67, said he was on the block when he heard workers "crying out" and went rushing into the site. "They were trapped but not completely buried. I saw someone's head pushing out," he said. "We drew them out. They're lucky to be alive." Nine laborers were working on the building at the time of the collapse, Cartwright said. Firefighters searched open spaces at the site to make sure no one else was trapped, FDNY officials said. One worker suffered a compound leg fracture, Cartwright said. Four of the six injured workers were taken to area hospitals in serious condition, while two were listed in stable condition. None of the injuries was considered life-threatening, Cartwright said. Engineers with the Department of Buildings were on scene investigating. A spokesman didn't have further information. The building's management company, Z & J Management, did not immediately respond to a request for comment.